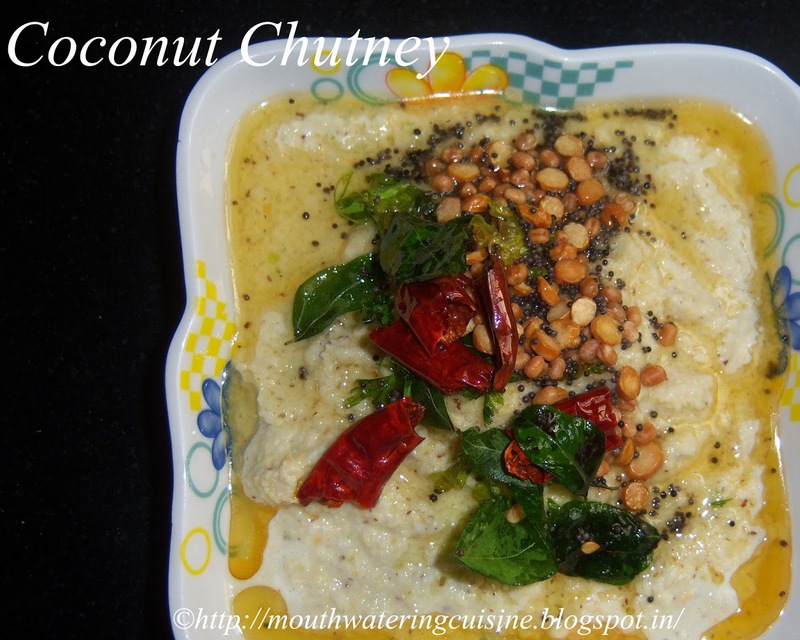 A very simple and tasty chutney for dosa, idli, upma or pongal. Normally this chutney is available with every one who serves breakfast. Making of this chutney varies from one another. Some people add garlic and some do not. Some add more coconut than roasted dal and some vice versa. Some add tomato also, it all depends on their taste buds. If we use fresh coconut it really tastes well. In India we get coconuts, so we get them and with the help of hammer will break the hard nut shell. We can grind it to make coconut powder or grate it. We can use either of it. In a mixi jar add coconut, roasted dal, green chilies, ginger, garlic and salt. Grind it to make chutney with it. Make a coarse powder of it. Add water to make semi-coarse and liquidize it. Heat oil in a frying pan add mustard seeds, black gram, red chilies and curry leaves. Season it with the above chutney.